Meanwhile, in a large nonstick skillet, heat the 1 tablespoon of oil. Add the shallots and cook over moderately high heat until soft, about 2 minutes. Add the mushrooms, season with salt and cook until tender, about 4 minutes. Add the garlic and cook 1 minute longer. Add the wine, scraping up any browned bits from the bottom of the skillet and cook until the liquid has evaporated, about 2 minutes. 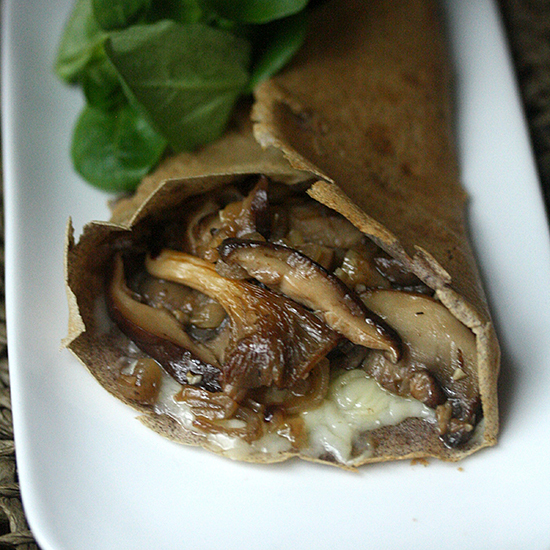 Sprinkle the crêpe with 1/4 cup of cheese followed by 1/4 cup of the mushrooms. Fold the bottom flaps of the crêpe to form a cone. Slide the crêpe onto a serving platter. Repeat with the remaining batter, brushing the pan with oil as needed.